After the Creative Input in January, ideas for new creations will be submitted to the competition and presented to the jury at the Creative Output event on March 24, 2017. Winners of the competition receive one of the grants adding up to a maximum of 3738 EUR total for realization of their creative work, which will be exhibited in May. If you have any questions, please contact us via mathcreations@imaginary.org. 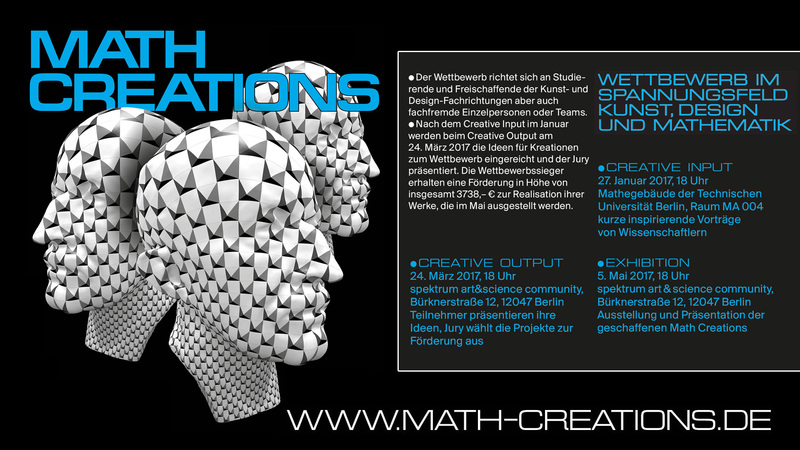 (Für Deutsch hier klicken: https://imaginary.org/de/project/math-creations) We are calling on students of the art and design fields as well as independent artists and designers to participate in the Math Creations contest for art, design and mathematics. The goal of the contest is new creative ideas based on mathematical concepts and their realization. 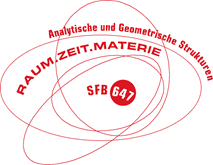 It is organized by the collaborative research centers “Discretization in Geometry and Dynamics” and “Space - Time - Matter. Analytic and Geometric Structures” in collaboration with IMAGINARY. Additionally, all participants are invited to exhibit their Math Creations at the Exhibition Event in May. The special prize for the most inspiring lecture of the Creative Input Event was awarded to Alexander Bobenko. His talk on mathematical circle patterns motivated six participants to submit a Math Creations idea. In the event video playback is not supported in your browser please click here. Participating teams present their ideas. The jury chooses the most promising math art projects to receive a grant. The results of the productive phase are presented and exhibited. All events are open to the public. We cordially invite everyone interested! A professional film crew directed by film-maker Ekaterina Eremenko (Colors of Math 2012, Discrete Charme of Geometry 2015) will record the events as well as the realization process of the winning projects. A feature film will be produced to be screened internationally, starring all winners and their Math Creations. Participation in the Creative Input Event is not mandatory in order to participate in the contest. However, your artwork should relate to the topics presented there. There is no restriction in age of the participants or format of the submitted ideas. Please send us an email until March 20, 2017 to register your submission. It should mention your name (and the names of your team members, if you participate as a group), the title and short description of your idea, which should be presented at the Creative Output event on March 24, 2017. Please also include the amount of money needed to realize this idea, and what it will be spent for. You will be asked to give a presentation of your idea at the Creative Output Event. The duration depends on the number of participating teams. We will let you know in advance by email. The language of your presentation should be English or German (English is prefered). Please also submit a description of your idea. We encourage you to include sketches and images of your planned work. Winners of the contest receive one of the grants adding up to a maximum of 3738 EUR total for the realization of their creative work which will be exhibited in May. Please read the detailed contest rules here in German and ask any questions beforehand. We are happy to collaborate with the Hybrid Lab of the Hybrid Platform, a project platform of the Berlin University of the Arts (UdK) and the Technische Universität Berlin (TU Berlin) serving the cross-disciplinary exchange of art, science and technology. Creative teams with members from UdK or TU Berlin can take advantage of the Hybrid Lab on Campus Charlottenburg, for example to create 3D prints. Participants of the Math Creations competition who are high school students may find a tutor for the lab from either universities.